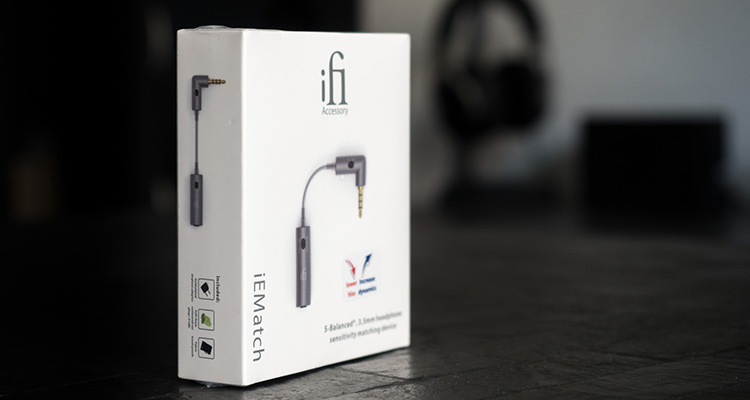 Just recently iFi Audio released a small and affordable little accessory called the iEMatch. It’s basically an analog dampener in form of a short dongle that wants to improve the compatibility with sensitive headphones and your ordinary headphone output. It does this by lowering the output volume by up to 24 dB, lowering hiss and increasing dynamics. Let’s find out if this is genius. 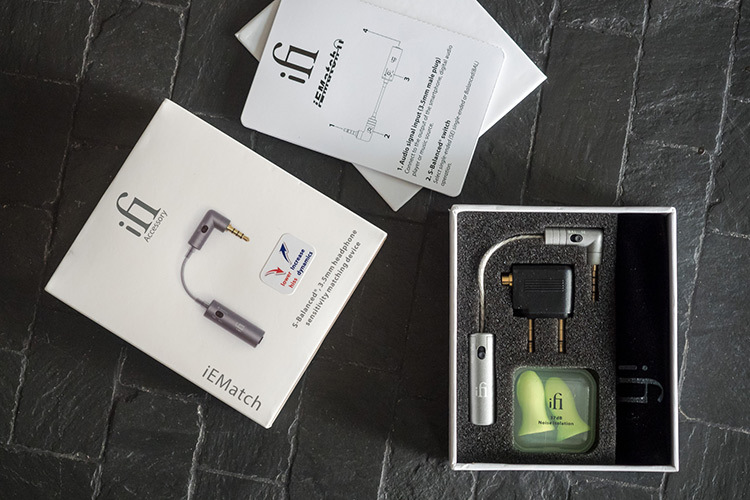 The iFi iEMatch come shipped in a small square cardboard box that slides open. There is nothing fancy going on with the packaging and there is no space wasted. Greenpeace can relax! Anyway, there is a black velvet pouch included, that – despite the iFi logo – has a very cheap feel to it. I did not use it, but it could be handy for somebody out there. It’s big enough to pack your CIEM, too, in case you don’t have a pouch for them already. I also found an airplane adapter in the box. While I think this could be useful, it seems the airplane connection is slowly dying. My last few flights did not even feature the double-jack connection anymore. Newer planes have a single jack and sometimes even USB. Probably the prices for the adapters dropped significantly and iFi decided that it would increase the value of the iEMatch package. Thanks, I guess. Finally, there is a pair of green foam earplugs in a separate small plastic box. (Uh oh, I hope Greenpeace doesn’t find out after all.) I’m sure you didn’t expect that! I put them aside for now as I want to listen to music. This would be a little bit difficult with foam in my ears. The build quality is solid throughout. iFi Audio used a gray aluminum body and gold-plated connections. You can see the individual pieces from which the final product was assembled and it won’t win any design awards, but its purpose serves functionality. The device itself consists of two pieces that are connected via a short cable. Both ends feature a black plastic slide switch and have a two-layered rubber strain relief that is simple as it is effective. The cable is twirled from 6 silver-plated copper wires, shielded only by a thin transparent rubber layer. Logo, serial number and switch functions are printed on the aluminum. So far they have proven to be quite resistant from being scratched off. 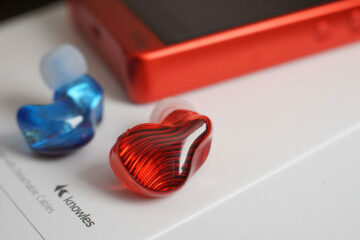 While the transparent cable boasts some hifi prestige, the overall product is not very attractive. White print on abrasive gray aluminum will most probably hurt the visual consistency of your portable audio chain. Surprisingly, that also counts true if your setup consists of other iFi products. Furthermore, the transparent strain relief is not tight around the cable and when bent it opens up a fairly big gap which undoubtedly will allow dirt to get inside – hard to remove, but easy for you to see. If you plan on using this device often, expect it to lose visual appeal eventually. Having that said, purely from a functional standpoint, the design does nothing wrong. The iEMatch dampens the amplifier’s output through the usage of resistors. Engineers will tell you it’s not rocket science. However, it is still a smart thing to do. Hiss is eliminated, dynamics improve and the dongle does not need any power supply. Granted, the feature list is charming. But are there really no cons to the pros? Well, pushing up the volume usually does increase distortion. The question is whether it will be audible in your audio chain. If you have a high-quality source with a clean output and low distortion, you probably won’t notice any negative impacts at all. However, would you even need the iEMatch then? That really depends on your setup and if you notice hiss or need more accuracy for adjusting the volume at low levels. There is also the issue of output impedance. 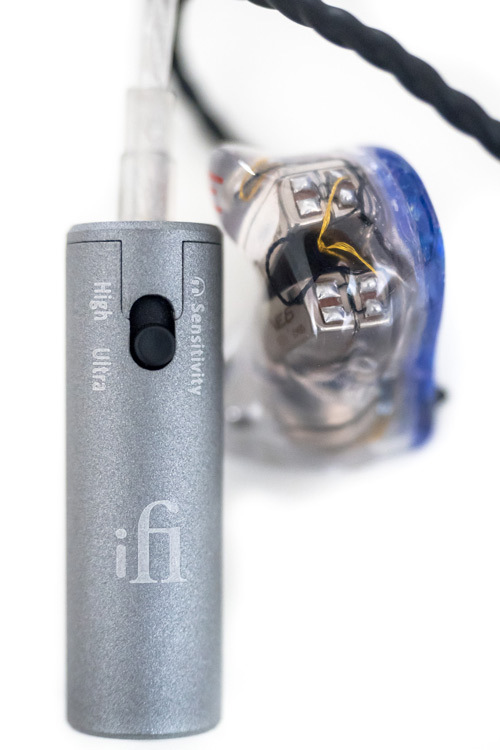 iFi claims the OI is below 2.5 ohms in the high setting. In fact, the impedance is dependent on the sources’ output. If the source has a two-digit output impedance, the high setting can easily reach above 3 ohms. The ultra setting is more stable and the impedance should remain close to and only slightly above 1 ohm. However, if your source already has a low output impedance, like Chord’s Mojo below 0,1 ohms, the iEMatch will increase the impedance up to 1. 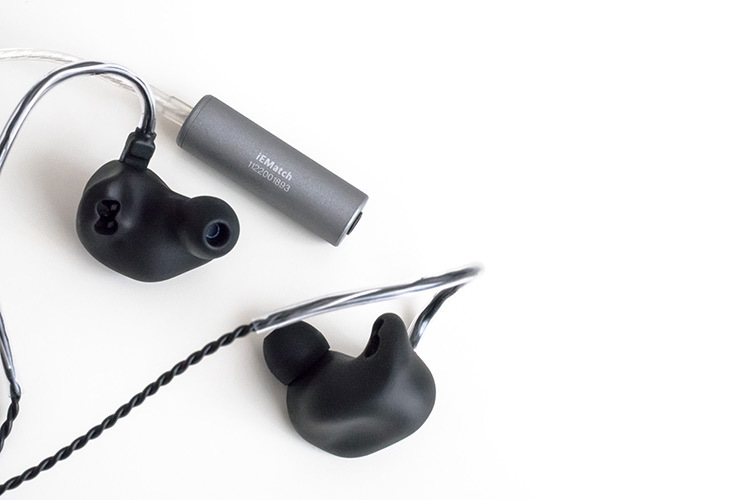 Unfortunately, if you use an ultra-sensitive IEM like the Campfire Andromeda, that is already enough to make them sound brighter than intended. In most cases, the iEMatch should not have any negative impact, so it is definitely advisable to have it accessible in your in-ear pouch. 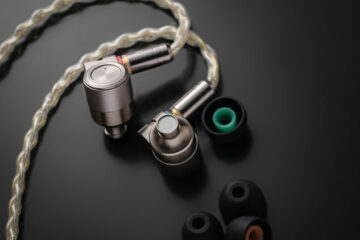 iFi Audio decided to provide the option for a 3.5mm TRRS balanced connection. Unfortunately, balanced cables with 1/8’’ termination are extremely rare. iFi themselves only feature the iCan Pro. I think HiFiMAN, Mass Kobo and the somewhat failed Pono Player support the connection, though. That seems a bit unfortunate to me because the TRRS termination could have been easily used for headsets, effectively maintaining the original cable’s remote and microphone functionality in case you want to link the iEMatch between your high sensitive headset and smartphone. Although it’s somewhat easy to re-solder a (multiple of) 4-wired cable to a balanced 1/8 inch termination, I could not test the balanced functionality because I do not have a device that offers this option without going through the hassle of building a custom adaptor. 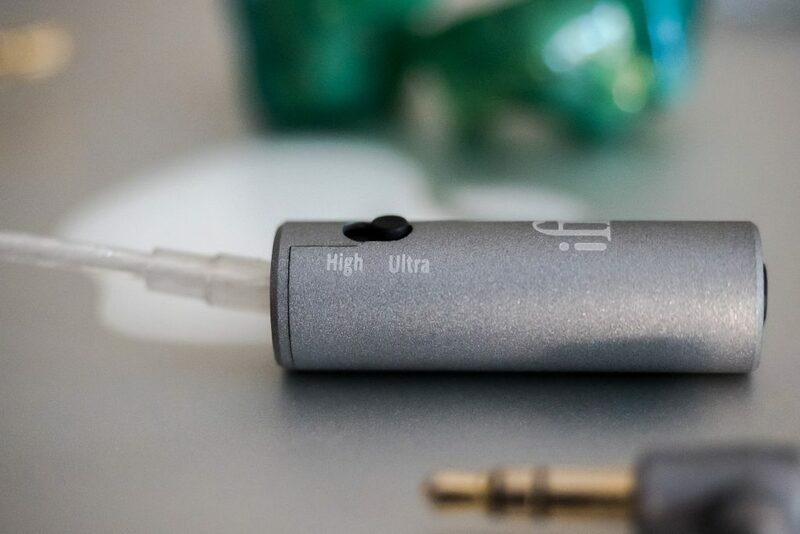 The iFi iEMatch is not a standalone headphone amplifier. The sound quality is ultimately dependent on the source and compatibility with the headphone. 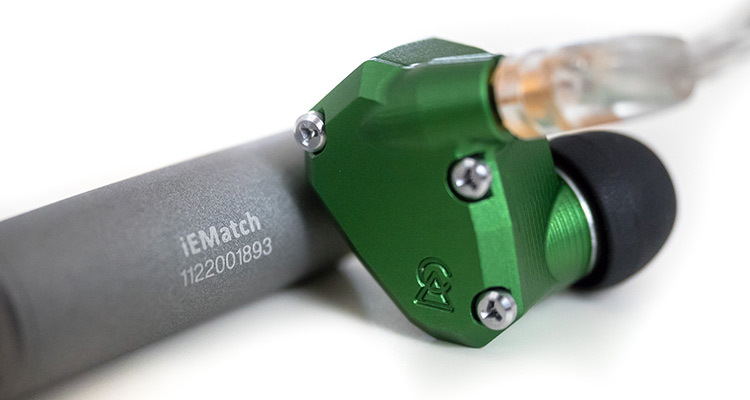 Since in most cases the iEMatch will clean the signal, many will perceive it as spacious and transparent sounding. This effect is most easily noticed when linking it with an iPhone (in my case 6S Plus). The sound will come off as more spatial and better ordered. If the source has enough power, treble can be better refined and clearer. However, this is not the case with the Nintendo Switch, for example. The volume cap is hit quickly and high frequencies become somewhat brittle. I admit this is a questionable example since the NSW is not an audio player, but a device I tested nonetheless. It substitutes for whatever low-quality devices you might want to use. If you own a Campfire Andromeda – and chances are high that you do -, you probably want to get the iFi iEMatch or your usage is fairly limited to only the cleanest of outputs. The Andromeda are extremely sensitive and pick up hiss from any source. Not only that, but they will bend their frequency response involuntarily if the output is not matched perfectly. In the specific case of the Andromeda, some would argue that they sound best from a source with 2 to 3 ohms. The high setting of iEMatch will just hit that target! Sublime. However, sometimes even an OI of around one ohm is not ideal. It can bend the frequency response very slightly for on monitors. This also counts true for the Shure SE846, which absolutely want a low impedance source. Even highly valued DAPs might not hit the preferred output target of less than 1 Ω. The iEMatch will help you to achieve that. 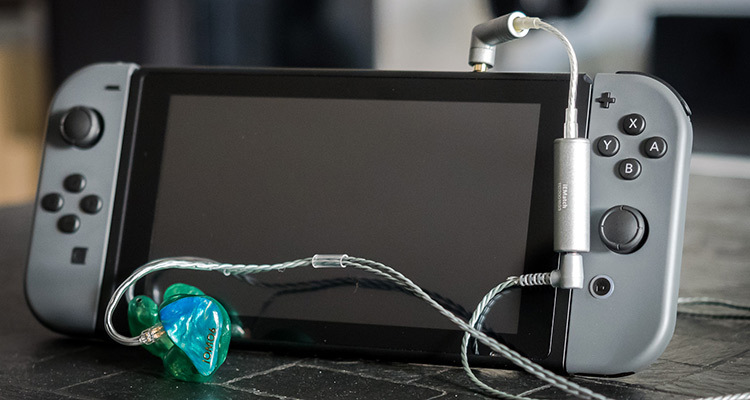 If you have hung on to the Ultimate Ears Triple.Fi 10 Pro for all these years, this might be a great chance to rediscover its strengths by largely increasing the compatibility of portable devices. But the iEMatch proves useful not only with multi-BA earphone designs. High sensitive dynamic IEMs also like to pick up hiss. From those that I’ve tried, the Sennheiser IE800, Shozy Zero, and various JVC/Victor woodies quickly jump to my mind. All of these can act like your girlfriend when aunt Irma visits. Luckily, the iEMatch will be as comforting as a box of pralines tied to a bouquet of roses. There are a bunch of headphones that were primarily designed for portable use. Among the most popular, you will find the Oppo PM-3. Contrary to the previously addressed extremely sensitive IEMs, the PM-3 care less about output impedance unless it is quite high. However, they do pick up background noise and allow the source’s sonic character to shine through. The iEMatch will help to place the spotlight on the headphones again. From my experience, the ultra setting will lower the volume too much. Even on high setting, the PM3 might be too quiet with some non-audiophile sources and you will hit the volume cap quickly. I experienced this on a well-equipped bus and the Nintendo Switch. Same counts true for the Meze 99 Classics or similar headphones. For lack of a better terminology, I just falsely classified relatively power-hungry headphones as “hifi”. The ones I am trying to group are headphones optimized for home usage, like Beyerdynamic Edition, Sennheiser HD6xx and less efficient magnetostatic headphones. Most probably you will be using a dedicated head-amp already. Chaining the iFi iEMatch will not have positive results unless your amp outputs audible hiss. Instead, the iEMatch might increase unwanted distortion and ultimately have a negative impact on the audio chain.